The Asheville Street Railway concentrated its activities in the City of Asheville and its near suburbs. Just beyond the original Asheville City Limits, there grew up other lines, some at first steam, later electrified, others always electric. R. S. Howland was involved in the lines for much of the time, but the convenient term “Howland Lines” is not entirely accurate. The line to Weaverville was entangled in the complicated affairs of the Howland Group but unlike Howland’s other more fanciful local transit adventures, it was able survive and even prosper for a time. Its history requires its own chapter. 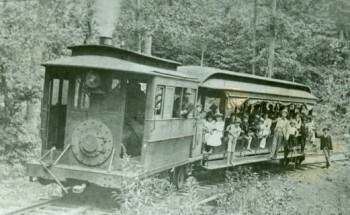 The first of the group was the Asheville & Craggy Mountain Railway, chartered on 11 March 1889 to build a 25-mile-long line to Craggy Mountain, northeast of Asheville. The ambitions of A&CM promoter, Walter B. Gwyn, were beyond economic reality and enthusiasm for the line was limited. While $500,000 in stock was authorized, only $25,000 was subscribed. Needless to say, Craggy Mountain was never reached. The company was formally organized in 1890 and obtained a franchise to build and operate a steam-dummy line on Charlotte Street in Asheville. In the Fall of 1890, rough grading was completed from the northern end of Charlotte Street to the top of Sunset Mountain, a distance of only 2.5 miles. The line opened on 1 May 1891. Track was laid as far as a switchback on the mountain. In 1892 an extension was made to a rock-crusher on Smith’s Hill, about four miles out. The trestle across the French Brand River. Pack Library. 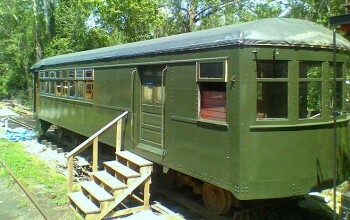 Passenger service was provided by a steam dummy engine and an open passenger coach. The dummy train ran from the end of the Asheville Street Railway at Chestnut and Charlotte streets to the end of the line on Sunset Mountain. Motive power was provided by an 0-4-2 dummy engine (Baldwin #9958) which had been built for the Knoxville Real Estate Co. in April 1889 and was their #2. It became Asheville & Craggy Mountain #11. The open coach appears to have been a 14-bench vis-a-vis (fixed back-to-back seats with half of the passengers riding backwards) open car built by Brill (order 1818) for Knoxville Real Estate in late 1887. Its number is unknown. The roster was completed by a new gondola car (numbered 1) built on Brill order 3487 in May 1891. Initially, the dummy line operated only during the summer. It had limited business and went into receivership, probably in 1895. It was sold at foreclosure to George Pack in 1895, although Gwyn remained as president. Since there were no funds for maintenance, the physical plant deteriorated. By 1898, it was in such bad shape that it operated for only a short part of the tourist season. Despite the poor physical condition, not a passenger was hurt during the years the dummy ran. During the 1890s, new homes were built in the Charlotte Street area which had, during The War Between The States, been Camp Patton. As the population grew, a need for public transport arose which was not satisfied by the seasonal steam dummy service. To provide better service. the receiver of the Asheville Street Railway in the spring of l899 leased the A&CM track on Charlotte Street, north from Chestnut Street to the point where the line started the ascent of the mountain. A wooden station was built where the wire ended, and the steam and electric lines terminated there. The A&CM re-emerged into the public consciousness when Richard S. Howland, editor of the Providence Journal (RI) moved to Asheville where he would become owner of the Asheville Citizen. Arriving in late 1899, he moved into a cottage in Albemarle Park, near the foot of Sunset Mountain while he waited for completion of a house built on the side of mountain just below Sunset Drive. In the Spring of 1900, at about the time that Asheville Electric was making its move to control all of the city lines, Howland purchased the rights of way, charter and other property of the A&CM. He began construction of Overlook Park, a 27-acre facility at the top of the mountain and announced that it would be opened to the public in the summer of 1901. W. B. Gwyn was retained as secretary of the new company. There was initial friction between Howland and Asheville Electric. The two were unable to agree on terms whereby the Asheville city cars could continue to operate to the city limits and Howland petitioned the city for the right to operate horse cars connecting with the electric city cars at Chestnut St.
About this time, the Asheville Country Club, which had been situated in various locations, including West Asheville and Woolsey Gap, and the Swannanoa Hunt Club joined forces and built a new club north of the Swannanoa Club at the end of Charlotte Street. It became known as “Golf Club” and became a focal point for Asheville society. Golf Club was also the name for the Charlotte Street junction of railway lines right outside the club grounds. The golf course was eventually incorporated into the present Grove Park Country Club, while the Asheville Country Club relocated to a site along Merrimon Avenue. Howland found that the condition of his newly-acquired railway could not have been worse. All the ties were rotten, the drains filled with debris, and the rolling stock rusting into a condition of innocuous desuetude. Under Howland’s direction, the line was practically rebuilt. New were laid on rock ballast. Old trestles were replaced, some curves relocated and guard rails placed at dangerous spots. Most important, wires were strung for electric operation. A car barn and engine house was constructed at the Golf Club where the Craggy Mountain and Charlotte Street lines met. 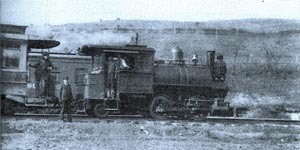 Forney locomotive 11, marked “H. I. Co.” (Howland Improvement), with Brill combine car 3 at the Southern Railway interchange at Craggy. Pack Library. The line purchased a small fleet of electric cars to serve the line, all from Brill. The first two were 16-foot deck-roof closed cars on Brill 21E trucks (order 10788,3 January1901), which were numbered I and 2. Out of respect for the laws of gravity and the mountain grades, the little cars were equipped with both hand and air brakes. They were painted a “soft buff ” color. A steeple cab locomotive (order 10800, 16 January 1901) on Brill 27G1 trucks provided the motive power for freight and summer excursion service, together with the old Baldwin steam dummy, which was retained for stone trains. The dummy now carried the initials “H. I. Co.” for Howland Improvement Co., rather than the name of the Asheville & Craggy Mountain R. R. In addition, the line had six 10-bench vis-avis open passenger trailers of unknown origin which arrived in August 1901. A newspaper report indicates that these were originally open top cars. It was argued that roofs would not be needed because most of the trip was “through the woods protection from the sun is not needed.” While this may have been true, it overlooked the threat of summer thunder storms and the cars were soon equipped with rather flimsy arch roofs. There were 19 freight cars, used primarily for hauling stone, and two pieces of work equipment of uncertain origin or purpose. The stone cars operated before the electric passenger cars began service. In March1901, the Charleston (SC) News & Courier published an item on trolley freight service, picked up from the Asheville Citizen. “The handling of freight over the rails of the Asheville & Craggy Mountain Railway is an excellent object lesson for those who are doubtful of the success of the trolley in the freight field, and Asheville has the distinction of being the first in the country to employ an electric line in building macadam roads. The stone for the mile of macadam on Charlotte Street is loaded on cars at the crusher on Sunset Mountain and is delivered faster than the steam roller can compress it, and as the contract calls for 15,000 tons of material from the quarry, one can easily understand to what extent the public is accommodated by trolley freight cars. The service rendered by them in favorable weather could not be duplicated by 75 or 100 teams.” Many more loads were sent to the freight station on College Street, then on to building sites in the area. Initially Howland tried unsuccessfully to arrange trackage rights over the Asheville Street Railroad to reach Asheville’s Public Square. Asheville Electric attempted to buy the A&CM from Howland in September, 1900 in order to complete their capture of all of the local railways but Howland refused to sell. By the spring of 1901 the two rivals arrived at an understanding. Howland transferred the title to the Charlotte St. tracks already leased and operated by the Asheville Street Railway. In return Howland obtained rights to run Craggy Mountain cars through to the Public Square. There is no evidence that the latter was ever done. The Asheville Citizen of June 7, 1901 described the park and the trolley line soon to be opened. Noted was the magnificent view to be obtained, even from Golf Course Station, a 12- by 25-foot building with three platforms for passengers changing between city and mountain cars. About 500 feet above Golf Club Station was the 70- by 14-foot car barn, complete with shop facilities and crew room. Beyond the car barn was a switchback which became a prominent feature of the railway. The layout was so designed that a locomotive could change ends around a freight train. From the switchback a footpath was extended to Pleasant Mountain. The views from the end of the 1,500 foot walk were reported to be the finest. The reporter noted that the same high standard of track, grading and layout which Howland had started was continued right to the top. At Overlook work was being rushed on pavilions, lawns and walks. Trees had been cut away along the line to permit riders to get the full sweep of the view which included Gouche’s Peak, Richmond Hill, Dryman’s Mountain, Weaver’s View, Spivey’s View and the Newfound Mountains, and the ranges culminating in Mt. Pisgah. Howland extended the line from the stone quarry about a mile up the mountain to Overlook Park in May and June. After some test trips beginning on or about 2 July, service through to Public Square began with a complimentary tour for Asheville’s mayor and aldermen on the 4th of July. Regular service began the following day with six round trips daily from Pack Square. The excursion was not cheap. Round trip fare was 50 cents but still the line was well patronized. Effective 1 August 1901, half-hourly service was instituted from Golf Club, connecting there with the city cars. The new fares from Golf Club were 5 cents one way to Switchback and ten cents to the Park. Excursions at special rates on through cars from Overlook through to the Square continued to be offered. There was a Moonlight Excursion on Wednesday evening, and special cars on Saturday and Sunday to both afternoon and evening concerts. Direct cars back to Pack Square were also scheduled after programs ended at the Park. 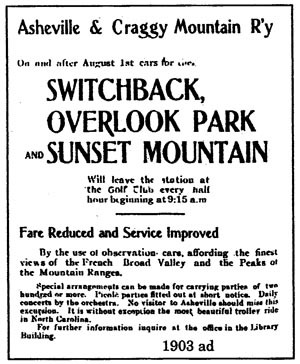 Under the heading “Fare reduced and service improved” another ad said, “By the use of observation cars, affording the finest views of the French Broad Valley and the Peaks of the Mountain Ranges, special arrangements can be made for carrying parties of two hundred or more. Picnic parties fitted out at short notice. Daily concerts by the orchestra. No visitor to Asheville should miss this excursion. It is without exception the most beautiful trolley ride in North Carolina. For further information inquire at the office in the Library Building. Later in the year, Howland learned the pitfalls of running a seasonal line. Business dropped sharply in September and service was reduced to six trips a day. In mid-December there were only three. Service appears to have stopped completely around New Year’s 1902. Howland now decided to resume steam operation, reportedly because the Asheville Electric Co. could not provide sufficient power to operate the line. A second steam locomotive arrived on 26 February 1902 and a 30-foot closed passenger and baggage combine (Brill order 11600, ordered 16 December 1901), numbered 3, appeared on 31 March. This was unmotored. Steam trains were being operated by April and new attractions were being promoted. The Citizen, April 20, 1902, announced the opening of a Studio and Art Institute at Overlook and described the unusual climatological situation there. “This particular thermal belt extends along the east side towards Overlook Park about 2,000 yards. There is a difference in temperature of about 12 degrees between this side of the mountain and the other.” A description of Justic Spring followed. The spring was another featured attraction. “It is situated about 3/4 of a mile beyond Overlook Park on the [route of the] Locust Gap extension,” the article noted. Other notices informed the public that “one or more open cars will be attached to each train and these can be decorated with candles and incandescent lights.” The notice further stated that Aganippe Spring Water was for sale at Overlook as well as at the company offices on the square. Other advertisements offered “Rough stones for foundations and walls delivered at College Street freight yard in quantities to suit.” This traffic was the original reason for the electric locomotive. The winter weather, heavy steam trains, poor construction, or a combination of factors left the roadbed in poor shape and it was necessary to suspend service while repairs were made. When it resumed in mid-June, only four trips a day were offered from Golf Club to the Park. Trying to keep the line active as the season advanced, a notice in The Citizen, October 1, stated that a sun parlor would be built at Overlook, “at the end of the plank esplanade where visitors can sit and enjoy the view regardless of weather.” Also it brought news of a “Northern physician interested in establishing an open air sanitarium there for the cure of consumption and similar ailments.” And on November 25, another front page article gave a detailed report of the delightful weather being enjoyed and the strong patronage of Overlook Park by people using the electric cars of the Asheville & Craggy Mountain. In spite of the promotion, the first three years of operation were unpromising. The stone trains operated prior to 30 June 1901 produced a deficit of $793. During the first year of passenger service (1901-1902) the deficit ballooned to $8,528. Sigmficantly, revenues on 39,000 passengers represented less than 40 percent of the total income. In 1902-1903. with electric service partially replaced by steam trains, the deficit dropped to $7,308 and 52,000 passengers were carried. Considering that income was less than half of operating expenses, it became evident that something more had to be done. In the spring of 1903, Howland extended the line about a mile beyond the entrance to Overlook Park with a new terminus at Locust Gap. This was completed in late May. By July, Howland had a crew of 300 men grading a road from Locust Gap to Bull’s Gap, about seven miles closer to Craggy Mountain. This was to be an automobile road and was to be used for logging and tourist traffic. 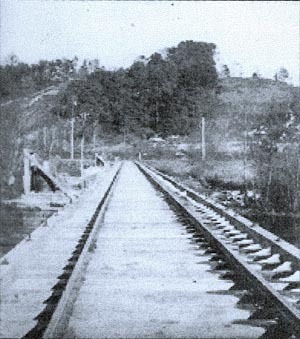 Abruptly on 5 August 1903, Howland announced that the Overlook Park line would be torn up, blaming Asheville Electric for having provided an inadequate power supply. Overlook Park was closed on 24 August and the property used briefly as a private school. Efforts of local promoters to secure a reprieve for the line were unsuccessful and a track gang began tearing up the line on 8 September. Normally such an event would be described as an abandonment, but this was an unusual case. Since the passengers would not come to the line, Howland decided to move the line to the passengers. There had been many proposals to build a line to Weaverville and the Asheville & Weaverville Electric Railway & Power Co. had begun construction in July, 1901. The company ran out of money in late November but insisted as late as March, 1903 that the line would be finished. In May, Howland made his move. He announced that the Asheville and Craggy Mountain would build a new line from Golf Course station to the French Broad River. The line as finally built would run north from Golf Club and crossed the present Kimberly Avenue near the Grilling Blvd. intersection, coming into Grace at the present Ottari Road intersection. (Grace Episcopal Church). It then crossed Baird Flats to New Bridge and followed the lower valley of Beaverdam Creek westward to the French Broad River at Elk Mountain Cotton Mill (Wm. Whittam Textile Company — now Burlington Mills). A branch was built north (downstream) to the Weaver dam and electric power plant. The main line turned south, crossed the French Broad River and connected with the Southern Railway at a station called Craggy. This station was later called Gorman’s Bridge. It had no connection with Craggy Mountain near Mt. Mitchell northeast of the city. Piers of the bridge can still be seen in the French Broad. No attempt was made to hide his intentions to acquire the rights of the A&W and to extend the line to Weaverville. Grading of the right of way began in July. By the time that the Sunset Mountain line was torn up, the right of way from Golf Club to Grace had been prepared and the track was unmediately relaid over the new route. The first steam-powered excursion train ran over the new line on 17 October, less than six weeks after the track had been removed from Sunset Mountain. Hourly trips were scheduled between 10 a.m. and 4 p.m., connecting at Golf Club with Asheville city cars. The line was extended to Burnsville Road on Beaverdam Creek and put in service on 23 November with three trips a day. There was no ticket arrangement with the Asheville Street Railway and no service south of Golf Club. An interesting supplemental service was a motorcycle service which was to operate between Beaverdam and Weaverville, meeting the trains and carrying messages and small packages. The extension to the French Broad at the Weaver Power plant opened on 9 April 1904 with daily excursion service being provided. The line was closed in early May to regrade the approaches to the river, which were apparently beyond the abilities of the steam trains to surmount. By 25 May excursion trains were being operated from Golf Club to Lake Tahkeeostee (the name given to the pool backed up behind the Weaver Dam on the French Broad). One train was operated daily and four on Sundays. As in the case of the Sunset Mountain line, the Craggy line claimed to be operated by both steam and electric power. However, it is known that the west end of the line was not electrified until 1905 and there is no evidence of a separate electric operation at the east end. A picture of a steam locomotive with the Brill combine coach exists. Howland was primarily interested in freight traffic at this point and the line derived some freight interchange from the Southern Railway at Craggy station. Howland’s ambitions, according to a letter written on 28 August 1903, included plans for an extension to Weaverville. It was claimed that this was already under survey and that construction would begin inthe Spring. There was no money for the project and the project languished until March, 1905 when he secured a charter for the Asheville and Northern Railway, which was to take over the whole business of the old company and complete the extension to Weaverville. It accomplished neither goal. Locomotive 11 and combine 3 cross the French Broad River at Craggy. The trestle was destroyed in the flood of 1916. Francesca Hawland Coxe. Nor was Howland’s beloved (but unprofitable) Sunset Mountain neglected. He secured estimates for a 2300-foot incline-plane counterweight railway from a point near the Golf Course to the summit of the mountain. The terminus was to be at an elevation of 3100 feet, 710 feet above the starting point and providing a 23 percent grade. The cost was estimated at a little over $23,000. In this matter, Howland seems to have been calling the bluff of the locals who had wanted him to retain the Sunset Mountain railway. He announced in November that he would not undertake the incline project as an individual and would require the support of local citizens, Asheville Electric and the Southern Railway. He didn’t get it. Another attempt was made in October, 1905 when he sought support from the Asheville Board of Trade for an inclined road with a 35 percent grade. A charter was granted to the Gravity Railway Co. in late November to build the road but the scheme was no more successful than the earlier ones. Meanwhile Howland pressed onward towards Craggy. The trestle across the French Broad to the Southern Railway connection was completed in October, 1904 and service commenced on 21 November 1904, the first through trip being a coal car from the Southern Railway destined for Howland’s coal bin near Golf Club. The first advertised passenger service was three days later when three trains were run to accommodate a deer hunt. If the Sunset Mountain line had been a disaster, the Craggy line can only be described as a financial catastrophe. The operations for the year ending 30 June 1905 showed a total of 18,981 passengers carried. 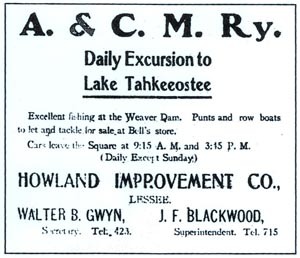 Even though the company advertised regularly (and somewhat desperately) in the Asheville papers about the joys of Lake Tahkeeostee, there were few deer hunters, fishermen, or admirers of powerplants and cotton mills who seemed to be interested. Nor did a freight bonanza materialize. For the year, the railroad received $1,566 in passenger and $686 in freight revenues. When “other” unspecified income of $1,971 was factored in, the road showed an income of $4,222. Unfortunately, operating expenses totalled $29,105, leaving a deficit of $24,883. Desperately buying tune, Howland next tried electrification to provide greater operating flexibility. A rotary converter was installed at New Bridge and what was announced as the first electric car ran between New Bridge and Golf Club on 18 August 1905. Service operated in the afternoons until 22 August when an hourly schedule was instituted from 8:30 a.m. to 11:30 p.m. Steam trains continued to run from Golf Club to Craggy at 6:30, 8:30, and 10:30 a.m., 2:30 p.m., and 4:30 p.m. The progress of electrification from that point is unclear. Sunday afternoon trains every half-hour to Craggy were announced effective 22 August, but the line still was not electrified fully and steam operation on a half-hour schedule was not feasible. It appears that electric cars were used east of New Bridge and steam trains to the west. It is known that electric cars were extended to Vance on 11 September and at that time, steam trains were running through from Golf Club to Craggy. Electric service through to Lake Tahkeeostee began on 6 October. The Southern Railway connection and the electrification raised freight revenues and dramatically cut operating costs. Still there was a $9,671 deficit for the year.